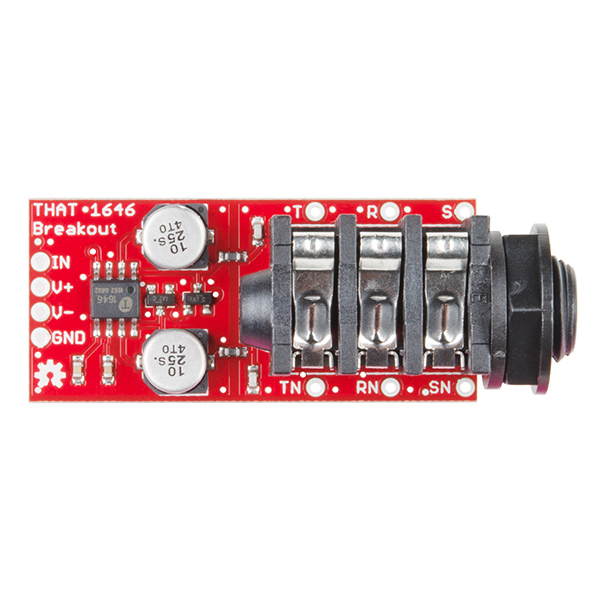 The THAT 1646 OutSmarts Breakout Board offers an easy solution to adding a balanced audio output to your circuits. The THAT OutSmarts technology has been designed as a high-grade analog line driver and offers a low distortion and high common mode rejection in real-world audio applications. 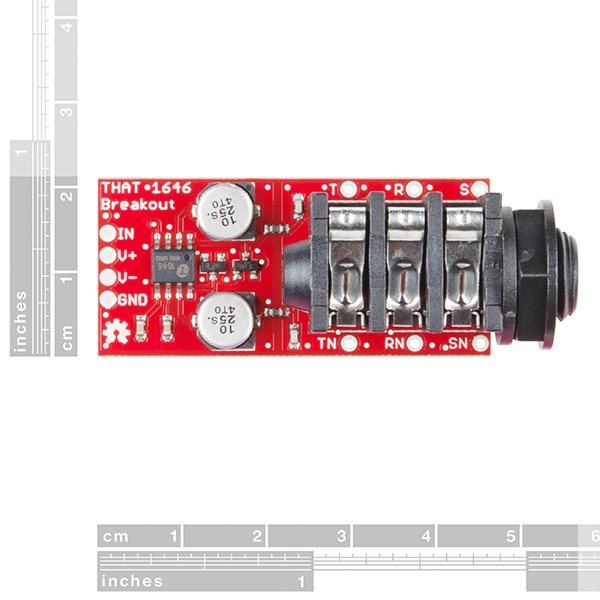 Each breakout board combines the THAT 1646 IC, its supporting components and a ¼" TRS (Tip Ring Sleeve) socket. 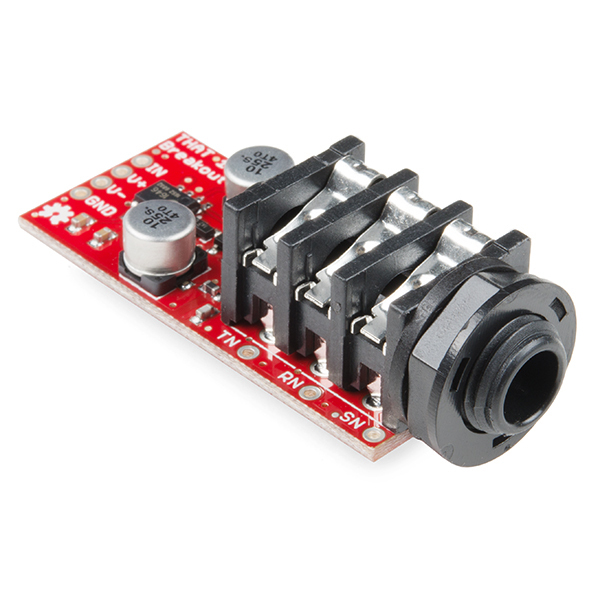 With these powers combined, you will find it very easy to use the output drivers on breadboards and in projects! The THAT 1646 OutSmarts Breakout and its sibling, the THAT 1206 InGenius Breakout, perform mirror-image signal conversion. While the InGenius is a balanced-to-unbalanced input receiver, this OutSmarts is an unbalanced-to-balanced output driver. We have made sure to break out each pin you need to utilize the OutSmarts board including the unbalanced input (IN), the positive and negative power supply rails (V+, V-) and, of course, ground (GND). Additionally, adjacent to each leg of the socket are test points for the signal (T, R, S) and normal (TN, RN, SN) contacts. This board would be so much more useful if it either came without the TRS jack or had a dual footprint for a TRS and an XLR3. XLR3 is the right way to send balanced audio. 1/4" TRS was traditionally reserved only for inserts and returns. "2. Both devices must be driven from a low- impedance source, preferably directly from opamp outputs, to maintain the specified performance." Look at the part's internal schematic. It has a moderate input impedance, 5kÎ©. The pin labeled "GND" really isn't a power-supply return pin, it is just a side of another 5kÎ© resistor whose other side goes to the op-amp's input. The op-amp inside the 1646 is configured as a non-inverting amplifier, so if you look at the common configuration for such an op-amp, you'll see that this second resistor is the Rin part of the feedback network. What does this mean? It means that if you drive it from a source without low-impedance drive, such as the wiper of a pot, the balance is wrecked. The result is asymmetrical drive, and that asymmetry is a function of the source impedance. This asymmetry might not be a problem in many applications where the connected receiver is a differential amplifier (THAT1200-series, INA217, or a diff-amp built from a pair of op-amps, or a transformer) and in circuits with the standard Â±15 V rails and standard line-level (+4 dBu) audio. 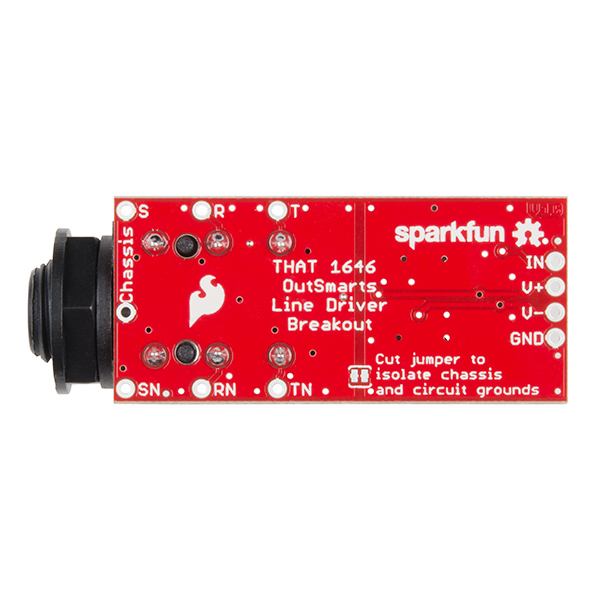 But if you power the 1646 from reduced rails, like its Â±5 V lower limit, you'll clip easily. So you definitely want to drive this guy with an op-amp. This is great, I love it but I need it with an XLR-3 connector. Is the board layout compatible with a board mount XLR connector as well? Perhaps Neutrik? If not, can you offer with the TRS connector unpopulated so I'm not paying for a connector I can't use?